At first glance, the small Mediterranean island of Cyprus with its reputation for sun, sea and sand, doesn’t have much in common with her normal “patch” of Central and Eastern Europe. But Caroline Gilby MW reports from Cyprus finding both the former Eastern Bloc and Aphrodite’s island have faced some similar challenges. Cyprus is a wine country full of surprises. For instance, it is one of the few places in Europe that has never had Phylloxera – which means its old grape varieties have survived and indeed many of its vines may be centuries old. Its wine industry is dominated by native grape varieties led by Mavro (rather ordinary) and Xynisteri (high quality). Some of its recently rediscovered ancient grapes are so rare they are not yet in the ‘Wine Grapes’ bible – names like Yiannoudi, Morokanella and Promara. Cyprus also has some of the highest vineyards in Europe, going up to around 1500m and therefore also one of the longest harvest seasons of any wine country stretching from the end of July well into November. And there’s so much more to discover. Today Cyprus has around 50 wineries and the trend has been to focus on higher quality, production moving away from the heat of the coast closer to the vineyards in the hills. And a new generation of winemakers has made a huge difference. Many young Cypriots go abroad to study, returning with an international perspective to add to Cypriot winemaking traditions. 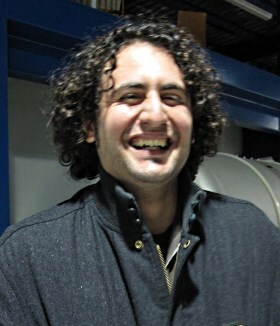 For instance, Sophocles Vlassides (Vlassides Winery and consultant to Domaine Agyrides) studied at UC Davis, Marcos Zambartas (pictured, Zambartas Wineries) read chemistry in London before heading to Adelaide in Australia for a winemaking degree, Minas Mina (Kyperounda) has a Master’s degree in food biotechnology from Glasgow, and so on. Generally, today the best wineries have qualified winemakers or oenologists rather than simply relying on tradition and gut feel. Cyprus shares another feature with some parts of Eastern Europe such as Romania and Hungary, and that is the importance of local grape varieties, though of course conditions are very different. Without the benefit of altitude, Cyprus would simply be far too hot and dry, so vineyards usually start around 500m and go up as high as 1500m, possibly the highest in Europe. At these heights cool nights help keep vital acidity and aromatics in the grapes. This is especially important in the flagship white Xynisteri (whose name actually translates as “lacks acid”), which is the second most planted grape. Mina believes that, “Xynisteri is the champion of Cyprus as it can grow everywhere, cope with drought and can produce wines ranging from easy-drinking to intense and mineral and also great sweets in Commandaria.” At Kyperounda Winery, where even the winery is at 1100 metres, natural acidity gives Mina the option to do a partial barrel and lees ageing, resulting in possibly the island’s best Xynisteri – named Petritis (shipped by Novum wines). Most Cyprus wine is not currently exported, but if you have the chance other good Xynisteris come from Zambartas, Tsiakkas, Vasilkon and Vlassides. Other local grapes that seem to have quality potential include the dark Maratheftiko with its notes of black cherry and herbs (Look out for Zambartas, Domaine Agyrides, Tsiakkas and Vouni Panayia), the dense and tannic Lefkada (arguably best in blends), and whites like recently rediscovered Morokanella (try Gerolemo) and Promara (Vouni Panayia is promising). 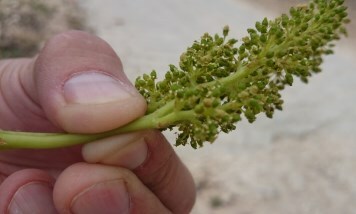 Yiannoudi is another red getting attention (picture of young Yiannoudi flowers, right) – found in the garden of someone called Yiannis a few years ago, and while its structure and flavour look great, it is pretty tricky in the vineyard to get a crop at all as it has problems with flowering properly. The most planted red variety is Mavro, and while it is a good table grape, so far no one has made convincing wine from it – though Zambartas is keen to try with a plot of 100 year-old vines. This highlights Cyprus’s Phylloxera-free status, with strict quarantine measures in place to make sure it stays that way. No one quite knows why – whether it’s physical isolation, the very chalky soils or the altitude – but it does mean that vines can get to great old age with the natural concentration that brings. Winemakers do get frustrated by quarantine as it limits the future availability of good ‘international’ vine material and working with overseas nurseries to improve the clonal selection of the local varieties. However, it is clear that Rhône varieties already planted, such as Shiraz, suit the climate better than Cabernet and Merlot (Vlassides and Makkas are varietal versions to look out for, but Shiraz is also important in some seriously classy blends like Kyperounda’s Epos Red, Vlassides Private Reserve and Zambartas Shiraz-Lefkada). A look at Cyprus wouldn’t be complete without a mention of its iconic sweet wine, Commandaria. But as in other regions where there is an iconic sweet wine – think Douro, Tokaj, Cotnari and even Sauternes – these wines are becoming increasingly commercially challenging and all these regions are putting considerably more emphasis on dry wines which are easier to make and easier to sell. Commandaria is also seriously undervalued considering the cost of production – the big brands are on sale at the airport for less than 10 euros for a wine that may be 15 years old. And locals tend not to drink it because it’s associated with communion and being forced to go to church. Commandaria may be the oldest named wine still in production, still using winemaking methods described as long ago as 800 BC, but it doesn’t fit today’s drinking fashions. Still, arguably it should be a part of the Cyprus wine story as it is the one wine anyone has ever heard of from Cyprus and so today a number of producers are trying to give it a new face. Commanderia is made from sundried grapes of Xynisteri and Mavro, produced in 14 specified villages in the Troodos mountains and may be fortified (but increasingly is not by newer producers). Minimum ageing is two years in barrel, though in practice it is usually considerably longer than this. Several producers are now buying the young wine from the region and ageing it themselves with more careful control over barrels and oxidation. For the most committed, like ex-banker Costas Tsiakkas (right), who actually rents tanks at a winery in the region to control the winemaking from the beginning too. 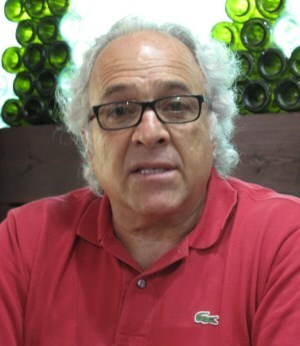 Tsiakkas says, “I agree the sweet wines are not the most sought after wines, but Commandaria should definitely be included and should be a flagship wine.” New wave Commandarias to try include Tsiakkas, Kyperounda and Aes Ambelis, while look for Etko’s 2000 St Nicholas or Keo’s St John great examples of a more traditional fortified style. 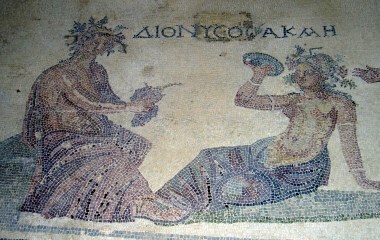 Winemaking on Cyprus dates back around 5,500 years but in its current form, the industry is still young. There are already some genuinely exciting and unique wines to discover and there is surely more to come as producers continue to learn. Let’s raise a glass to that. Yamas!